**Please note: We are starting to phase out the old Msgr. Donovan uniforms. As of September 2016 all incoming students must wear new Donovan Catholic attire. Students must maintain a neat, clean appearance appropriate for school attendance and co-curricular activities. 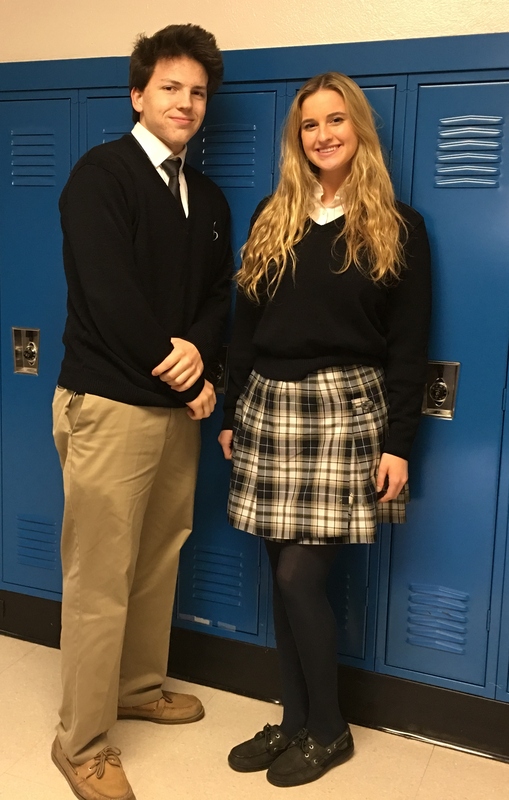 Students are representatives of Donovan Catholic at all times; their appearance must reflect Christian values of modesty and dignity. The regulation dress code will take effect on the first day of school in September and will end on the closing day in June. The Dean of Students will announce when the winter dress code begins and ends. Students not complying with the dress code will receive detention/demerits and may be denied classroom attendance until they comply with the code. The Administration maintains the prerogative to determine the suitability of any individual's appearance, including proper skirt length and hairstyle. Male students must maintain neatly groomed hairstyles consisting of one natural color, which may not cover the eyes. Hair that reaches over the collar must be worn in a ponytail. Female students’ hair must be neatly groomed with natural coloring. Accessorizing, bold unnatural hair coloring and body piercing are not permitted in this school's environment. Students may wear one earring in each ear. Gauges are never permitted. No other visible body part may be pierced.